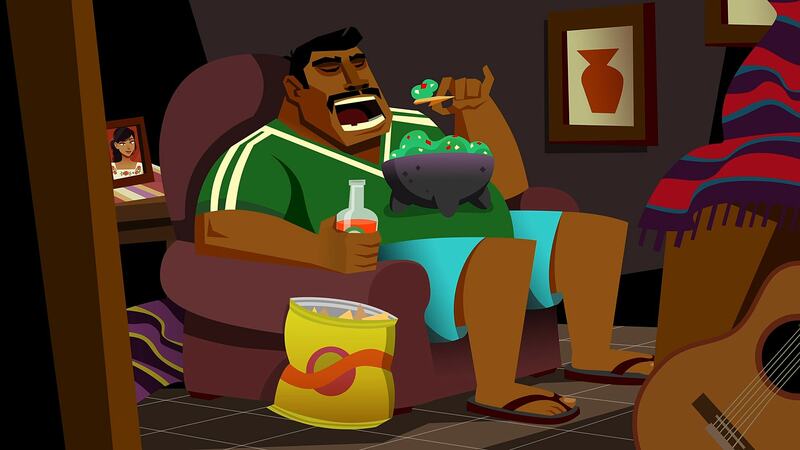 Seven years after the events of Guacamelee, the famous luchador fighter Juan Aguacate has… let himself go a bit, to put it mildly. Saddled with an intellectual wife and two boisterous kids, Juan's been living the easy life. Developed by DrinkBox Studios, Guacamelee 2 draws everyone's favorite legendary luchador out of retirement for a new adventure. Inspired heavily by Mexican folklore and history and pumping with an electro-Mexican soundtrack, the long-awaited sequel brings eccentric characters, a colorful palette and some serious fun to the screen. 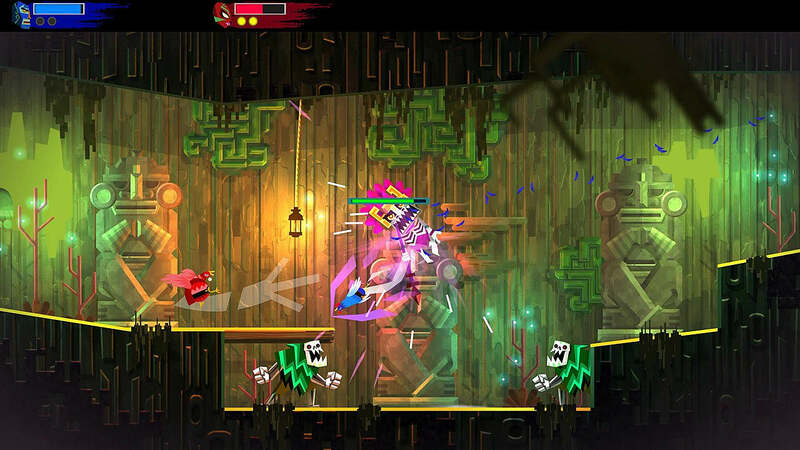 Note: This reviewer has not played the first "Guacamelee" but is well-versed in Metroidvanias. After a brief tutorial showing the final events of the last game, Juan is sent on his first real quest in seven years: to buy avocados for tacos so his dear wife Lupita can finish her dissertation. But what starts as a simple enough task becomes a whole lot more serious when rips in time and space appear. Avocados forgotten, Juan is sucked once again into a whole different dimension. Juan is lauded as "the last Juan alive" and, once he gets his trademark luchador mask back, he's back to his old baddie-busting self. And thus, Juan, along with his companion Tostada and some more familiar faces, are back in an adventure to save the Mexiverse. This time, his opponent is Salvador and his companions. Timelines are collapsing in on themselves as Salvador steals relics in search of the mystical eternal guacamole. The story is not the big draw here, obviously, but the dialogues and writing are perfectly funny and tongue-in-cheek. 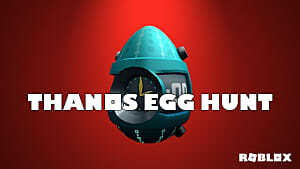 Expect plenty of fourth wall breaking, references to the previous game, and general verbal shenanigans. There are some weird and quirky characters, plenty of chickens, and pretty much all the silliness and character you'd expect from this game. Guacamelee 2 calls itself a Metroidvania brawler -- and for good reason. 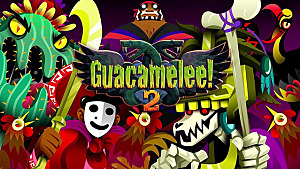 The gameplay is a fairly balanced mix of fights, platforming, and backtracking for goodies as Juan recovers his powers. All three are equally important, which means that if you're not very good at any aspect, you'll definitely have a hard time. 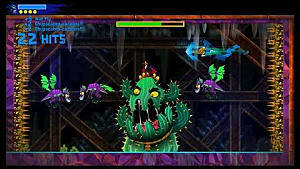 Juan fights his way through areas, greeted at intervals by "lucha" instances that pit you against a group of stronger enemies one after the other. 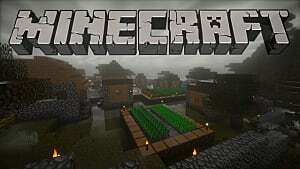 On the other hand, platforming is an integral part of the game's progression, and special moves like smashing a fist upward and shifting into the form of a chicken are used both to fight and to get to where you want to be. There are even a few "jump quests" that require you to navigate around moving platforms, spikes, and other obstacles to get to some coveted treasure chests. For the most part, the fighting and platforming are fluidly linked. 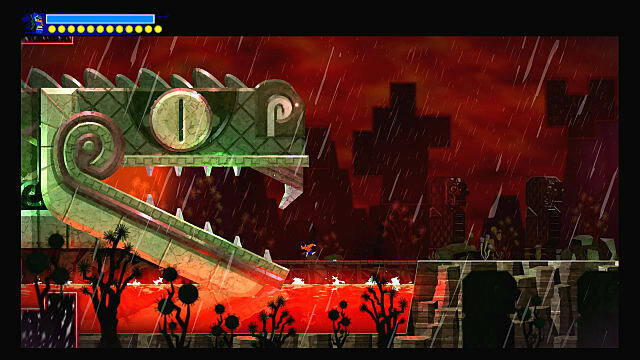 For example, Juan can uppercut from one platform to another and take out an enemy in the process. You can also throw enemies at each other or at your companion fighters, creating strategic opportunities. But the reliance on special moves means that playing this requires mastery of all your skills, which can lead to fumbling around. Sometimes this provides a welcome challenge but most of the time it's just frustrating, especially when you begin to use skills in rapid succession. Unless you are a button master, be prepared to fail. A lot. Although Juan's special skills are pre-set, there is some variety offered in the form of character trees -- literally: certain characters you meet offer up different skills for you to purchase using gold and special pieces collected from chests. As soon as Juan gets his mark of power back, he can get help from some friends. 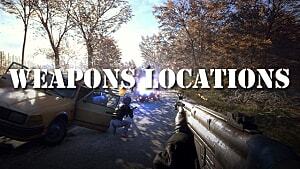 The game supports drop-in co-op for up to 4 players. The action is kept on one main screen, which means all players have to be able to keep up. 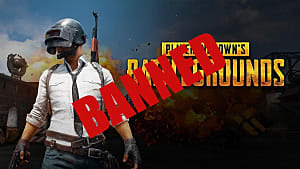 Once someone moves on to a different screen, all other players are warped after him. But when you're traversing through an area, the screen doesn't stretch far. That means every player has to succeed in the platforming, or no one can move on. This is all fun and games if you're playing with someone on par with your own platforming prowess, but if your companion isn't very good, the game can get bogged down. There are several characters to choose from, some of which start out locked. 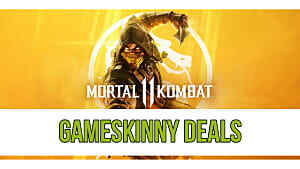 These are for aesthetic purposes only, and every player, regardless of their appearance, drops in with all of Juan's already-gathered special powers. 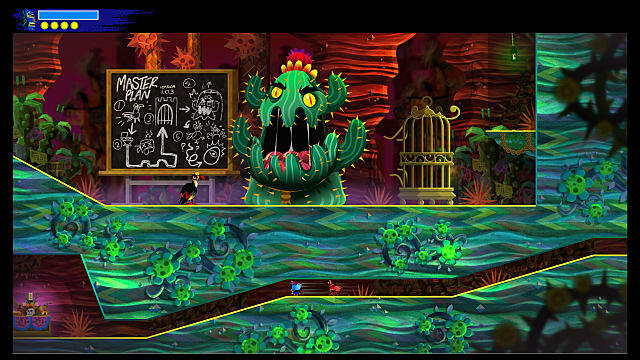 While there are many frustrations to this game, "Guacamelee 2" has plenty of good points, too. The artwork and characters are absolutely gorgeous, popping with color and shapes and drawing on traditional Mexican styles and mythology. 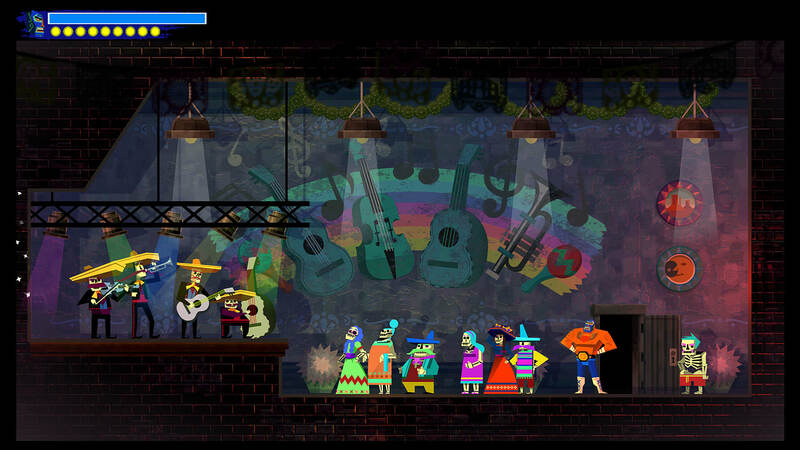 The Mexican-themed music can get a bit repetitive, but for the most part, it adds a great ambiance to a game already bursting with personality. The passage between timelines and its effect on the map is also a great mechanic, adding or removing platforms and other environmental elements in a way that's reminiscent of A Link to the Past. 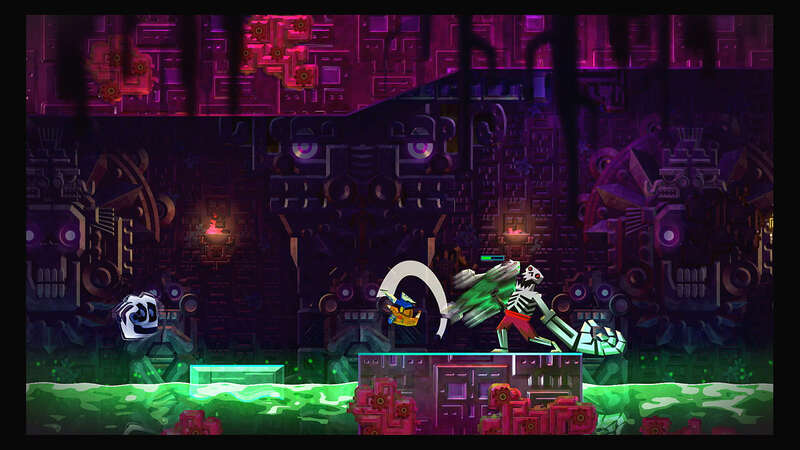 As with any good Metroidvania, finding a new skill is cause for backtracking, and exploration is encouraged through plenty of hidden spots and useful collectibles. 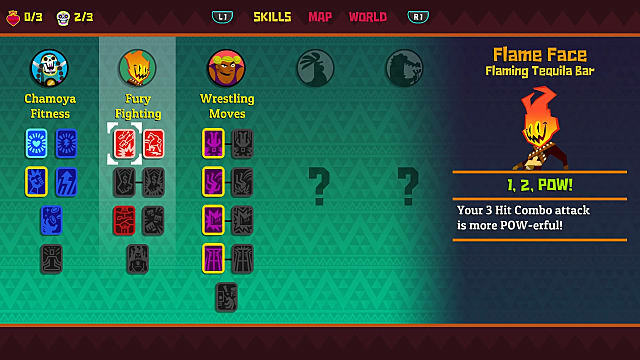 Speaking of hidden goodies, Guacamelee 2 is absolutely packed with Easter eggs. There are the very obvious Chozo statues, the accidental trip into the "Baddest Timeline" which asks Juan if he is "a bad enough dude to save El Presidente", the amazing "Dankest Timeline" which we won't give away, and so many other goodies to find in every corner. 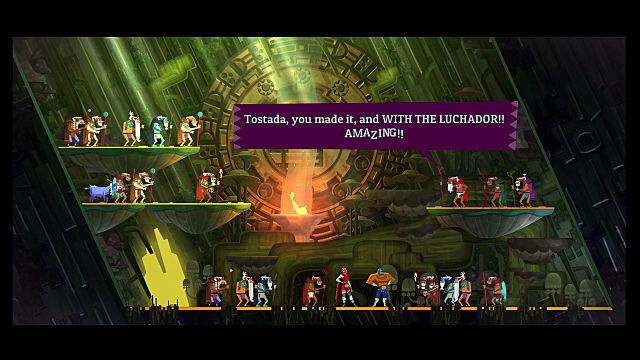 All in all, Guacamelee 2 is definitely a great game -- it's colorful, funny, and so full of personality and chickens that it's sure to win anyone over. 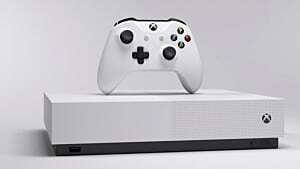 Just be ready for a challenge: brawler-inspired controls and some tricky platform-hopping mean the first few hours have a steep learning curve. 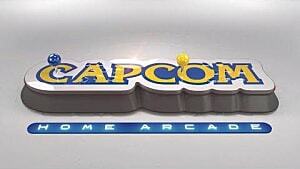 If you're a newcomer to either platformers or brawlers, you might want to cut your teeth elsewhere. Fans of the first game certainly won't be disappointed, as this long-awaited sequel is even bigger and more luchalicious than ever. Stay tuned to GameSkinny for more "Guacamelee 2" news and guides.